Oct 2003 – A planning application (Ref: 03/01668) for a 5 storey development was accepted, but eventually lapsed (due to financial reasons). 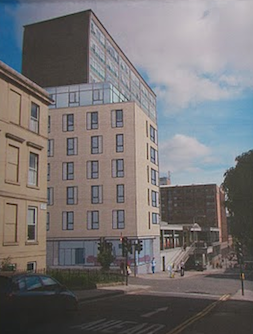 May 2010 – A planning application (Ref: 10/00840/DC) for an 8 story development of student accommodation was rejected at planning application committee stage. Aug 2010 – A 2nd planning application (Ref: 10/01837/DC) mostly identical to the May 2010 plan is submitted. 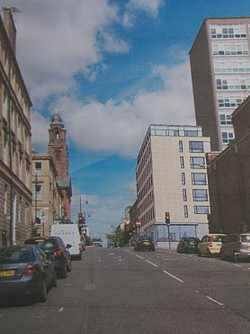 Aug 2010 – The planning decision of the 1st proposal (Ref: 10/00840/DC) is appealed by the developer. Sept 2014 – The planning application (Ref: 14/01362/DC) was considered by the Planning Applications Committee, which then approved the application by 9 votes to 2. No SNP councillors were in attendance. Link to current and previous planning application on City Council website. I note that the documents said it “will lead to the permanent loss of parking spaces”, but it is not only the several on the surface that will go. Also, a number (several?) will be lost from the underground Fleming House garage, due to the needs of foundations, structural support, plant rooms, cycle storage, etc, for the new 134 Renfrew Street building. The image below & attached illustrates my concern over residents’ parking. I think we GhCC need to be eternally vigilant. For want of a better suggestion, perhaps we could propose road space rental by developers, contractors, etc., rather as on motorway maintenance & upgrading work, to discourage use of road space by such firms & to encourage its availability or equivalent for residents. As a starting price, I would suggest a rental price no less than the average of car parking charges in the area. That would be a lot for a developer removing 20 places for 100 years! Say 20 x £10 x 365 x 100 = £7.3 million. I note that the documents also quote a capital value of parking, £20,000 per place I think. It would be interesting to know the basis for this. Furthermore, if we knew the rates & council tax revenues to be produced by the development, we might then form an opinion as to whether this might be a factor having a tendency in favor of council approval. The introduction of road space (lane) rental, whereby the utility companies pay a rate, differentiated by location and time of day, for the road space they occupy would certainly incentivise them to carefully plan when they will undertake works and how they expedite them. The charges levied should be constructed to reasonably reflect the value of the piece of ‘real-estate’ occupied and the cost to society of any delay imposed. The concept is no different to that of on-street paid parking – why should a private utility company enjoy free road space when the motorist has to pay to park in such space? Lane rental has parallels also with a differentiated road user charging regime. Government has been reluctant to progress such a road space rental option due to the potential inflationary effect on consumers utility bills. Trials a few years ago in Camden and Middlesborough, were argued to be inconclusive and the utilities lobbied extensively and successfully against any expansion of the trial. However, it was undoubtedly in the utility companies’ interests not to change their behaviour and accordingly to carry additional lane rental cost for the trial period and areas, so as to be in a position to argue that such a regime was both ineffective and inflationary! The regulatory environment would allow legitimate road space rental charges to be passed on to the consumer. A key issue currently is the difficulty of differentiating what would be legitimate costs to pass onto the consumer and what costs should be carried by the utility company for tardy or otherwise poor performance, as the regulators are not equipped to address this. • A road space rental framework that would enable regulators to differentiate between the quality of utilities’ street works and to only pass on to the consumer the rental cost incurred where works have been properly planned and executed/expedited.